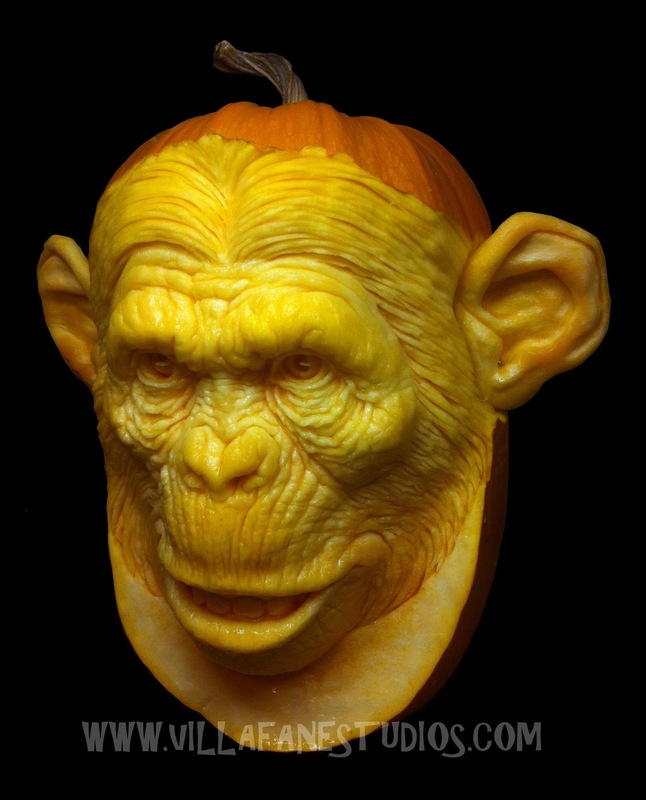 Some of my favorite sculpting artists take the time to share with the world. This list will grow as I remember or get exposed to more tutorials and sites that I can wholeheartedly recommend. A trend that I noticed and partake in: Facebook pages are being used by artists to showcase their works, and quite often, they include work in progress shots, and answer people's questions. I was just sharing a list of my favorite DVDs with a colleague, and realized I haven't compiled it before. Let's share it with the world! I consider each one of the following a precious resource in enhancing my skills as a creature designer. I learn as much by observing as by doing. Books are neat, but video is better for immediate clarity, at least for some of us. Working on new designs as I watch these videos is almost as if the instructor was right there with me, helping me with details and approaches. I can even rewind and pause them! Additionally, I love to watch those videos as a work on repetitive tasks that don't require me to problem solve. The techniques get absorbed further into my memory. I hope these will be of great inspiration to you, like they never cease to be for me. The Art of Sculpting, by Philippe Faraut. Definitely the series that will make every motivated person into at least a decent head sculptor. 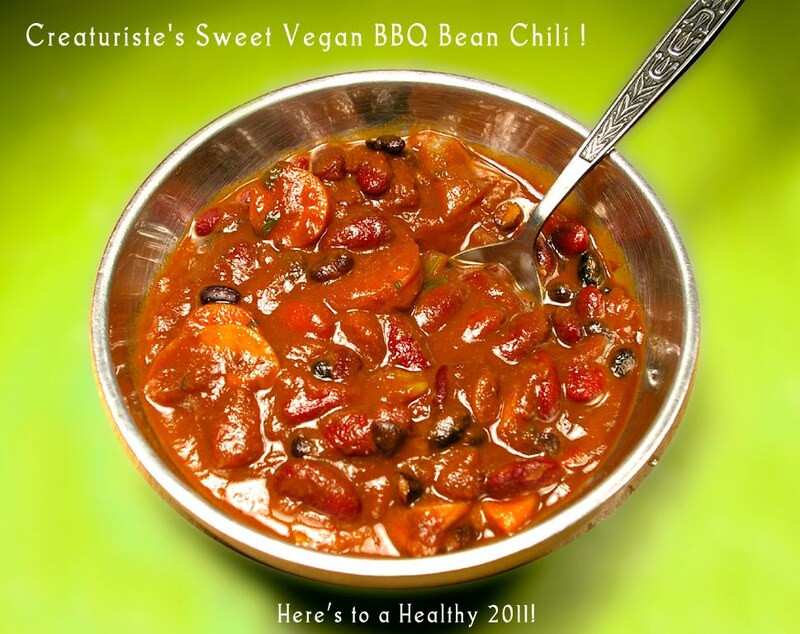 His method takes you from the total beginner to the advanced results in just hours. I'm eyeing his books too, especially volume 2. I wrote an article about the series here. this one has a lot less step-by step clarity, but you learn a lot by listening to his comments, and watching him work. Not a first choice for a total beginner seeking total clarity (Faraut's method is perfect for that), but still a useful resource, and I'm glad to have it. First series of DVD I tried. It is and will remain a great learning source. I own volume 2, but saw other volumes as well, and it's all top quality. Judge for yourself, each product's page has a video sample. I want to own the whole series someday. 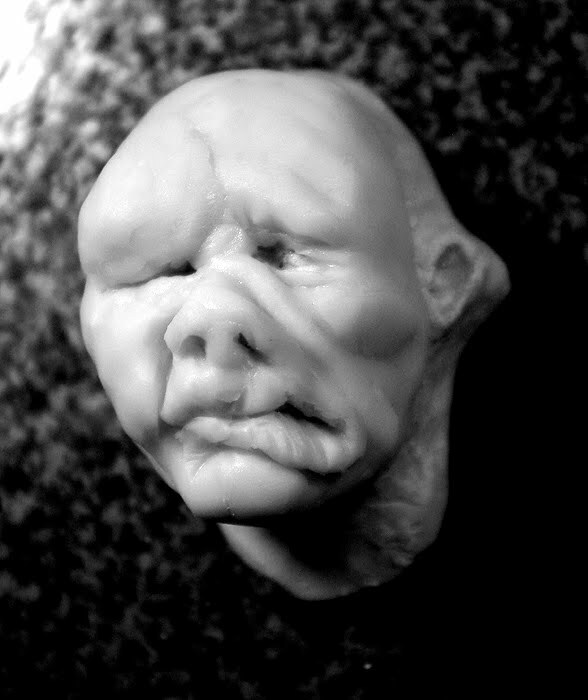 It's been a really good tool to help get more comfortable carving subtractively, even in clay. 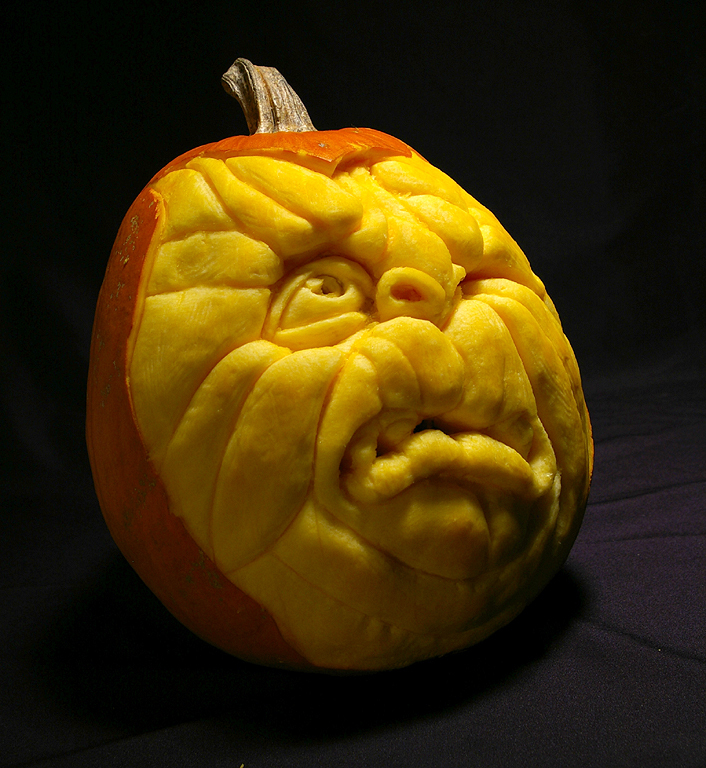 Learn by carving on pumpkins, and the skills are transferable to other media. The Ama - Soft Sculpture Body Construction, by Lisa Lichtenfels. I thought I could use this for puppetmaking, but found it difficult to adapt to moving puppets. Still, I use some aspects of her method, and the set is worth the price for the anatomical lessons on the first DVD. 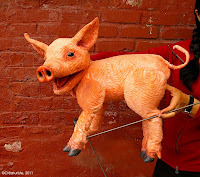 She shows you with illustrations, then color codes everything, then re-sculpts it all in clay, then does it with her polyester batting on an armature of wire. Fascinating! I'd love to see her other video! by Théâtre de La Pire Espèce and Marcell Hudon. It was happening in Montreal, but I hope this show will live on a bit longer and performed elsewhere. For the credits, see this page, in French. photographs of the career of Felix Mirbt. I wish there had been more to see, but it was a beautiful exhibit. I even learned a few techniques by studying the puppets and masks. I was inspired by both the exhibit and the show, fascinated almost against my will! I'm grateful to have gone and experienced it. Even though I did not know the artist, nor ever saw any of his whosws, this retrospective, created by people who were close to him, made me feel nostalgic and almost like I had met the man. I can definitely see some of his influence on what has been done in Canada since. 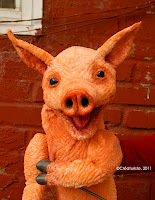 He is a defnite pice of puppet history. Some lessons and techniques people have learned from him have been passed on to me over the years. What spoke to me the most was his use of the materials and the methods as an integral and visible part of the experience of seeing the show performed. a lot of people try to hide the process, to make the illusion work. how you do it than look at your show." Strings were very visible on marionettes, some other types of puppets were missing hands or the hands were only there when needed, some body parts came from separate props or body parts from the puppeteers. 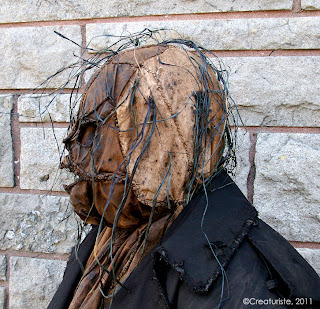 One puppet had a large mask for a head, while the body was a large piece of cloth, and the neck linking iot all together was a very visible ring of wood. Quebec and Canada. The man loved experimenting on every asopect from puppetmaking to how thw show was constructed, to how the music played a role, and it showed in his results. Refreshing and thought provoking. has been created. They mixed English and French texts, on the same pages. Beware that a loud sound file will start once the page is loaded. If you like these, or even if you want something completely different, consider me for the job. 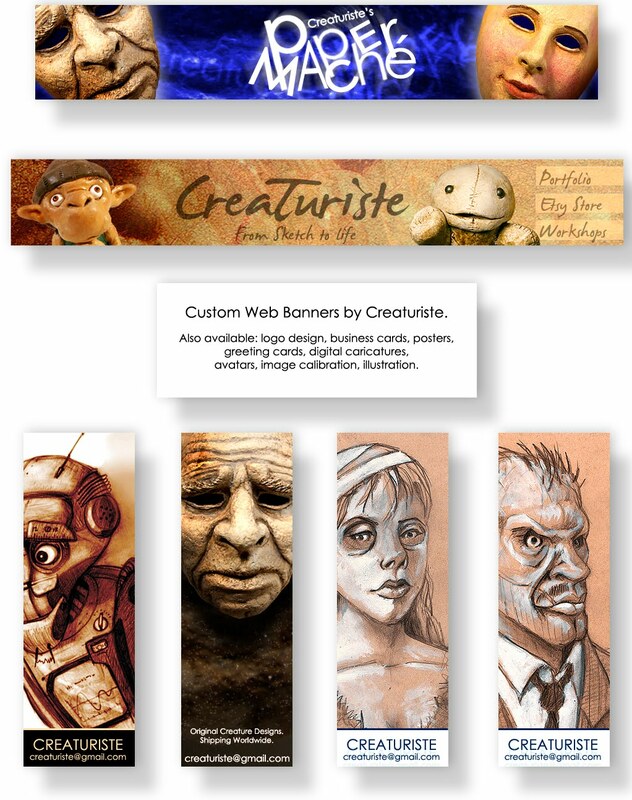 Really, I enjoy transforming images and drawings (yours or mine) with a bit of digital magic. Today I received the Ray Villafane pumpkin carving DVD, and it is a very good learning tool! Highly recommended for the lesson contents and ease of understanding. Disappointed by the image quality and lack of true bonus features. The lessons are very clear, and they are classified by complexity levels. It was filmed with two or three different cameras, so one can appreciate the steps better and with more clarity. Ray narrates live as he sculpts, so it feels like he's there in the room with you, coaching you every step of the way. The pace is probably a bit fast for some beginners, but hey, this is a video, and it can be paused and replayed. 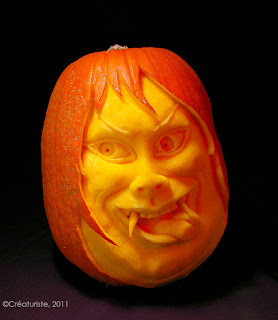 I'm very glad that I got this, and viewing it as I was working it has already helped me with my carving skills, and not just for pumpkins carving. These skills are transferable! The video quality is not impressive. It feels dated, as if it had been filmed in the 1980s, and transferred to DVD recently, without much remastering. It does the job for learning the steps, but even using my computer's DVD player software's advanced image enhancing features, and tweaking the options, the image details and colors are lot less alive than they could be. It looked a lot better on the television, however, so you should not worry too much about it if it's your main viewing option. But considering this was made this or last month, I was expecting a video quality that's a bit brighter, sharper, and more alive. They mentioned bonus materials, but compared to most other DVD tutorials I've bought, it's not cutting it in that department. 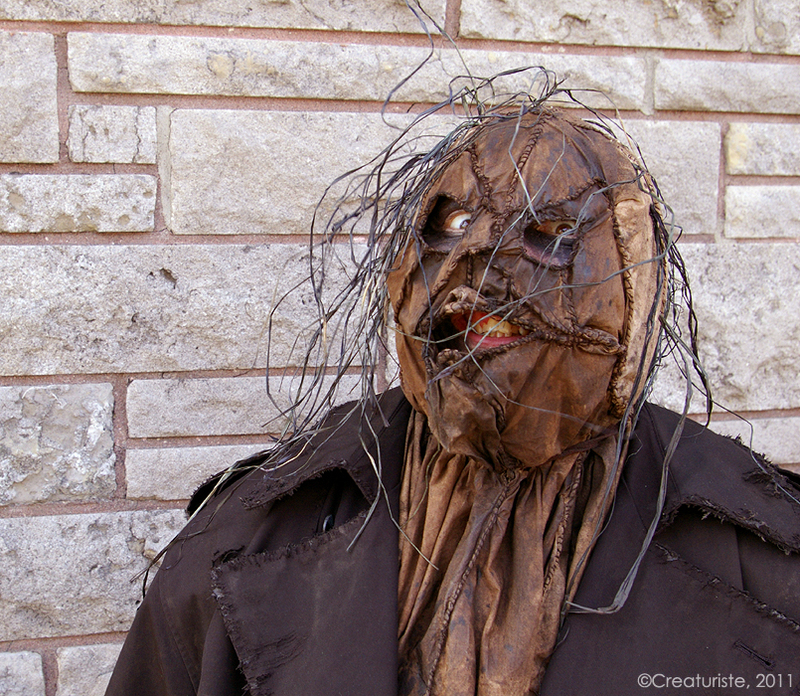 The bonus lessons are about how to make hands out of pumpkin vines and wire, and how to carve stitches. I'd consider these as integral parts of the main content, as necessity more than bonus. I'd have been angry if I had had decided to go with the downloadable version (I very nearly did, but learned it was in MOV format, which does not do well on my computer system), which does not contain the instructions for those two steps. Considering there is plenty of space on two DVD disks, I was hoping for at least a photo gallery section and some high def video footage of the best pieces in Ray's collection. Maybe even featuring the TV and web interviews Ray has done over the years. Arguably, there is a photo gallery, but it's a part of the intro, is only a few seconds long and shows less then the Facebook page's photo section. The Time lapse videos are very fast, and only appear at the end of each lesson. I'd have loved to see the progress slower, to really appreciate it, and have access to each sculpture's timelapse video on the main menu. Hopefully, there will be some better bonuses in the future, and I hope they will make it available for free to people who ordered the first batch. If you are not in a hurry, I'd wait a bit before ordering. They might make a better batch of DVD, as this one was rushed so people could get it before this Halloween. Right now there is a video section missing on how to choose one's pumpkins, and I noticed some editing errors. 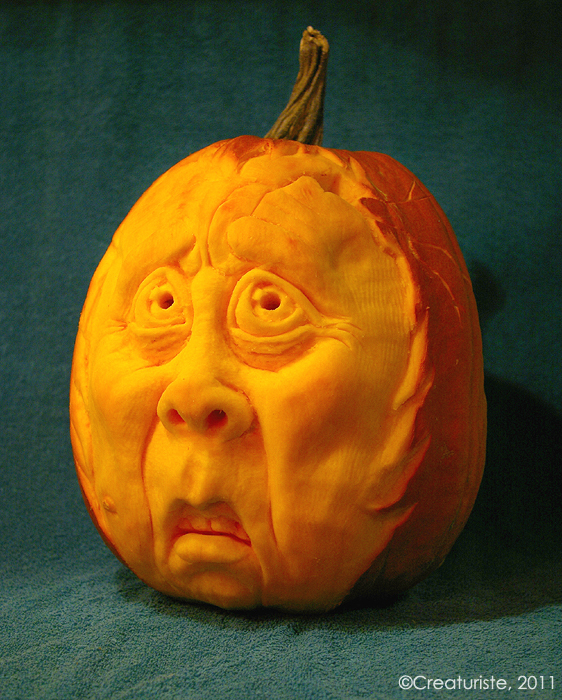 The missing info on pumpkin selection can be found as one illustration in the photo section on the Facebook fanpage. The disappointments do not remove the high quality of the actual main content, I'm still very glad I got the DVD for my ongoing training, but the package would have felt a lot more special with better image quality, with bonus features to watch and show to people, all in one place, instead of having to go online and checkout his sites. My Halloween activities have increased this year. Moan is my personal costume. I went with creepy this year, as opposed to my usual fun/slightly spooky looks. I went out with it three times. Today I went downtown, and I got a lot of the kind of responses I was looking for. Smiles, startled screams, and even a store manager having to follow me around, and admitting it to me, as my costume really worried him. On my way back to my bicycle, I went in to say thanks to my new optometrist and her staff for the glasses I got a few weeks ago, and I got an amazing response from her assistant. She was laughing uncontrollably! My friend's annual Halloween party doesn't happen this year, so I'm looking for another event in Montreal. The pumpkin is my first carved in 3D, following methods I gathered from looking at the works and videos by Ray Villafane, of Villafane Studios. Look at his Facebook fanpage, it's full of amazing photos and info! I ordered his Pumpkin Carving DVD, but haven't received it yet. I KNOW my carving will get better when I see more of his methods. I intend to carve as many pumpkins as my time will allow me until the season is over. After that, I'll turn to other root vegetables. 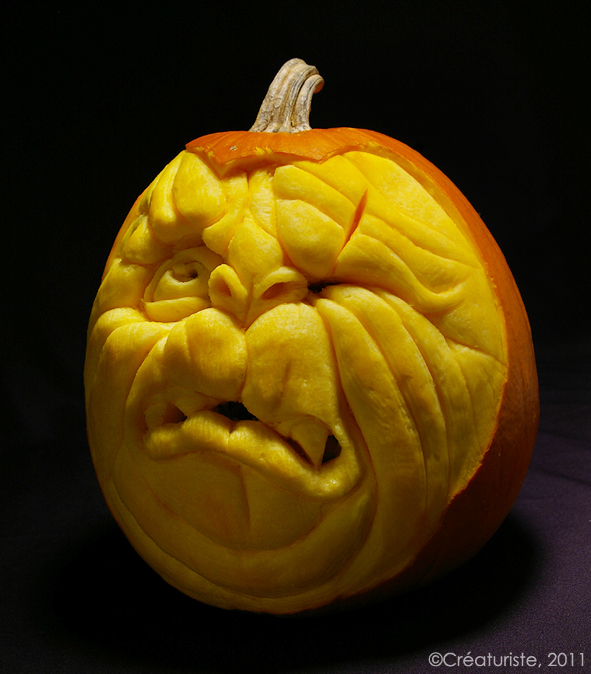 It's great practice for my overall subtractive carving skills, and I love the feel/texture/challenge of it. This makes me feel confident that I will be able to carve wooden puppet heads and masks to my liking, soon. 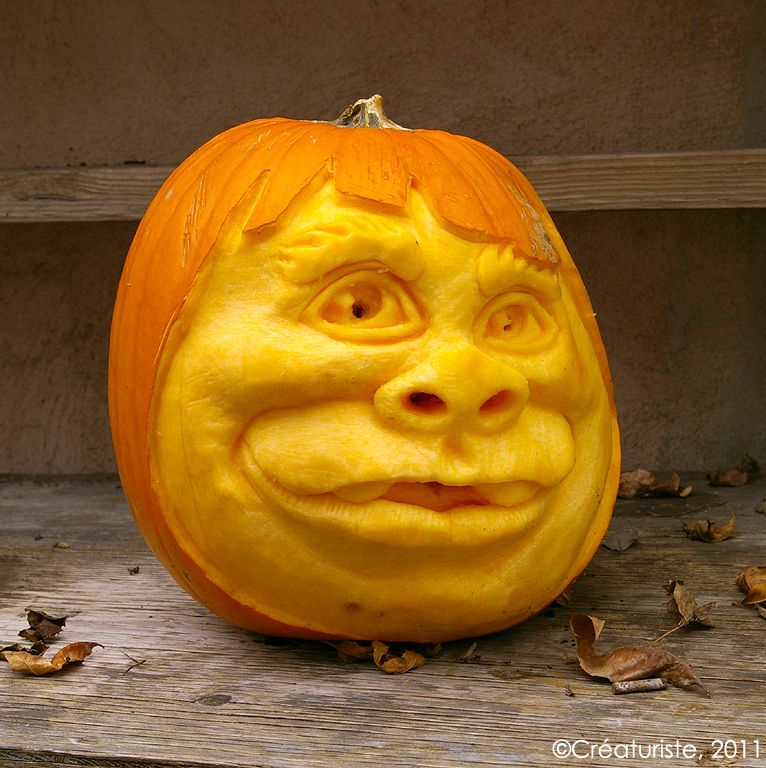 Likeness of specific subjects is to come later, but at first I'll be happy to be able to improvise creatures like I am able to do on pumpkins. Carla the Vampire has been sold as a Halloween decoration for a party this week-end. Second pumpkin I sell this week, thanks to my friend Daniel, who cut a deal with a pumpkin seller, who got impressed with our carvings. 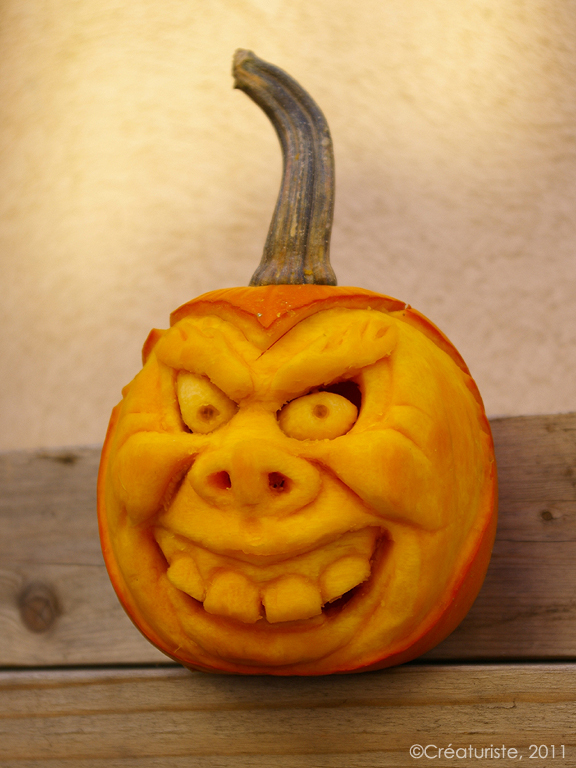 Two more pumpkins were carved today, October 28th. Might be my last this year. We'll see how the schedule goes. 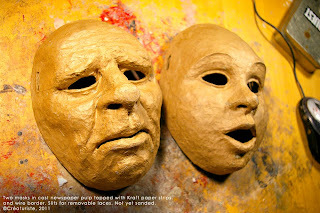 Unless I decide to alter some of their features, both of these oil-based clay mask forms are ready for mold making in silicone and plaster. 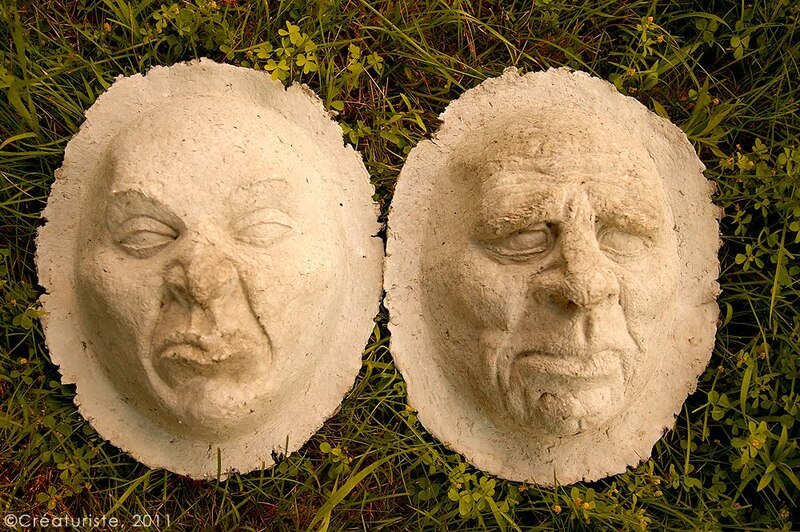 Both are part of a commissionned series of Character Masks for an Actor Training class, but they will make a good addition to my Halloween selection. The devil is based on my own face, when doing my imitation of the scariest evil face I can muster. 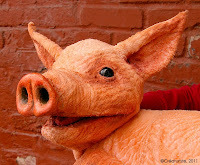 The Deformed man has canine and porcine sides to him. As such, I hope he is a vegetarian. It took me about 16 hours to model the Devil, while the Deformed took about 8 hours, since I improvised most of him, starting from the Old Man from the same series of masks. For me, Likeness takes longer than improvisation, as I have higher expectations for accuracy. To make pulp, just tear cotton linters, or wood-based papers, or pulp packaging material (like egg cartons, but use only clean, unsoiled cartons) into small pieces, put them in a tall bucket, use a mixing attachment on your electric drill, and spin until as smooth as it will get. Then let soak for a few hours, and repeat the blending. This basically acts like a giant blender that separates the fibers without cutting them shorter. Some people like to use a blender with a lot of water, one handful of pulp at a time, but it's tough on the motor, and it cuts the fibers even shorter, making it a weaker pulp. Using a sieve, drain the pulp a bit, then finish with your hands to remove all the water that will come out. Store in a clean, airtight container in the fridge, for only a few days. If you want a smoother result, or if you're not sure of the cleanliness of your pulp, boil it in water for a few minutes, let cool, then wring out and store in an airtight container in the fridge. If you need to store your pulp for a long time, flatten it into sheets, let it dry fully on a clean towel and in front of a fan or in the sun (not directly on the ground or near bugs), then store as you would sheets of paper, in a container, away from dust. When you need to use again, just break into smaller pieces, soak and blend. It will be faster than the first time. For a smoother version, to use as a detail coat over a stronger pulp, you can break the pieces even smaller, and pulverize them into a powder, using a coffee grinder. Be sure to let the dust settle before opening it again. I give credit where it's due, for this method, to David Osborne, in Great Britain. I'm partial to cotton linters, for the strength of the paper it produces, and for the very simple way to prepare the pulp from those easy to decompose sheets. I've gotten a sample ( a bucket) of wet cotton pulp from a paper mill, and it's bloody heavy to carry, on a bicycle. The same quantity, in dry form, would have been a breeze to carry, just like a sketchbook. Still, cotton linters are not easily accessible to me, so I'm experimenting to see if the strength of boiled wheat paste, well-blended into newspaper pulp, will be enough for may puppetmaking and maskmaking needs and criterias. I've been experimenting with making my own version of Celluclay, and I think I've got it finally, although it's not my version. It's everybody's version, because I had a lot of help in making it work. I did a first cast (first photo above) with an egg carton type of pulp, pressed wet and flattened with a sponge, to remove the moisture. Then I painted some boiled wheat paste over it, because I noticed it was going to crack and be weak. It took a long time to apply, and a longer time to dry, some definition was lost, and the result was a little bit weak, but I will be able to strengthen it with paper strips as I had planned. Then I was advised to add clay to the mix. Wow! It feels, behaves, smells, dries and looks like Celluclay! It took me no more than 15 minutes to apply the pulp into the silicone mold, compared to at least 45 minutes with the sponge methods with the previous batch. 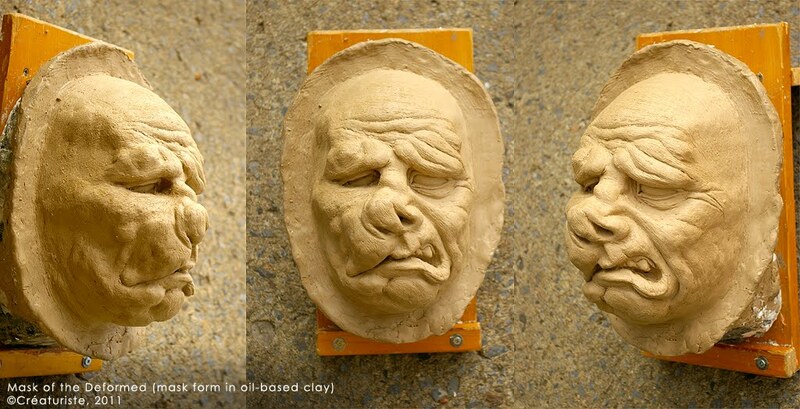 The picture to the left shows you a detail shot of the results, the following pics are from the same recipe with clay. Better definition, better detail, better smoothness. It dries a bit faster too, but it's twice the weight compared to the pulp-and-paste version. Still well-within acceptable limits for now. I will see when the masks are strengthened, sealed, and painted. Thin spots can be detected by placing the mask in front of a strong light source, and it can be fixed by adding more pulp until no more light is showing. Drying this quickly and thoroughly is very important to prevent warping. 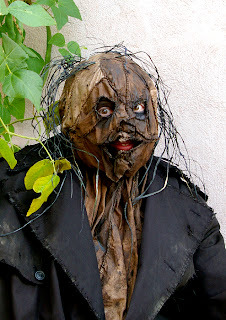 I will trim each mask, cut out the eye and nostril holes, add a wire rim around the mask's edge, and re-seal all cut edges with paper mache strips and boiled wheat paste. When fully dry, I will sand it where need be, seal with multiple coats of white shellac until water proof, then prime, then paint, then varnish. Click on pics to see the yummy texture! 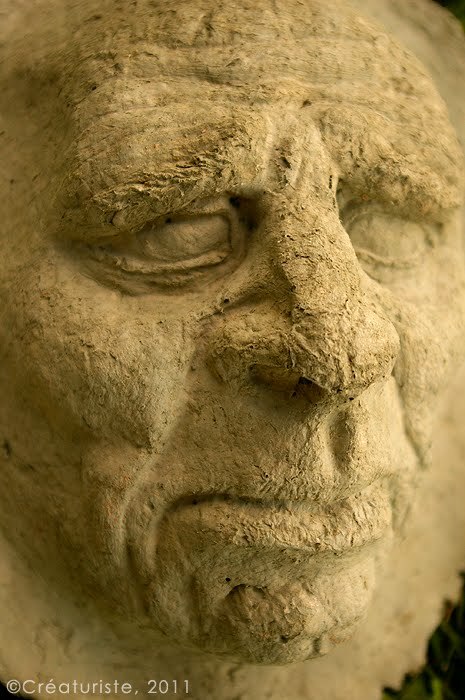 For years I was striving to make smooth paper mache strips, and when I succeeded, I realized it was not always a good thing to have the smooth perfection. sometimes it's just too perfect, too boring! Pulp has its own "living" texture, which is why I always come back to trying to make it work, in hopes of saving time and getting that wonderful subtle texture. I succeeded this time, with help, and I can feel the end result will be even better. The measurements are very estimated, because I eyeball everything, and go by feel, but this should work for you too. To make pulp, see this article. Mix the clay powder into the wheat paste until smooth, then incorporate into the pulp until smooth. If too thick, add little more wheat paste. To cast with this using my silicone molds, I made my mix into more of a grout than a "clay", so it was easily patted down in place, then flattened thinly into my mold, using a thick Cellulose sponge to aborsb the moisture and flatten the pulp. I use a smaller piece that I cut out of the sponge, to make access easier for smller areas. Try to avoid sideways movement, as it can pull the pulp and tear it. Every squeeze's water accumulation is squeezed out into a bucket. It also shows me how much water I was able to extract, and may indicate if I should make the next batch more or less liquid. You could use a latex mold. For a plaster mold, you'll need to seal it well to prevent the pulp from sticking to the plaster. White petroleum jelly is often used, but I prefer to use a soap based sealer. Next batch of the paper-clay, I'm going to try to reduce the amount of liquid, to see if it will reduce shrinkage. My first two masks with this recipe turned out well, however. Look for yourselves! The inner view shows an irregularity in color. I suspect it might be the clay needing to be mixed better with the pulp. Newspaper pulp mixed well with boiled wheat paste. No clay this time. My hope is that I will get the same definition, without the added weight that clay brings. •I made three new casts, using the newspaper pulp instead of the egg cartons. I boiled the pulp as a precaution. I saw the inks separate from the pulp. Kinda weird. My mix this time included clay, but more paper and wheat paste than the previous batch. Because of this, it was a more cream-like consistency, and was faster to apply, but was too liquid for reasonable dry times, and I was afraid of extreme shrinkage. so I got a new Cellulose sponge, cut a smaller piece off of it to make it easier to get into the mold details, and started pressing the moisture away. What a difference it makes to have a high quality sponge that's thick enough! Pressing without moving sideways is very important to prevent tearing of the pulp. Some of it will happen anyways, so add more wet pulp and press it down with the sponge. Invisible seams! I was able to remove between 1.5 and 2 cups of liquid with this method. I already have a smoother interior or the mask, the wall will be thinner, and the drying times will be reasonable, I can feel it! 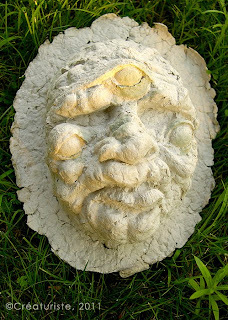 •I added a coat of wheat paste over the first cast of the three eyed mutant, since that first one's pulp was not mixed with wheat paste, just painted with it once it was inside the mask. It will help keep the texture intact when I start surface smoothing. •So far, I will have at least 4 new masks for sale before the end of summer. I'm very busy, but if I wasn't, I'd be rushing the finishing of the mutant mask, just so I can feel the fun of painting it! •Now that all the casts are dry, I was able to compare them (unsealed, no added paper strips or wire contour). Cotton pulp +wheat paste is the strongest, lightest and thinnest of all the mixes. It also shows less shrinkage and the texture is acceptable. 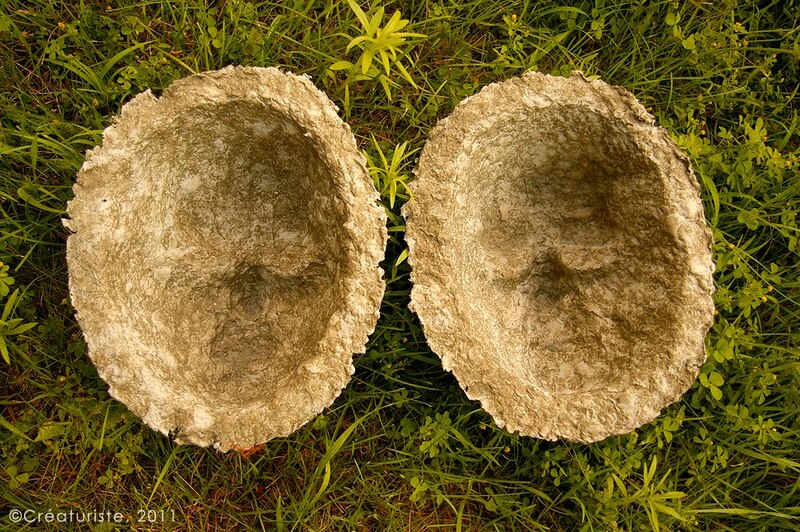 Adding clay to newspaper or egg carton based pulp (with wheat paste) adds hardness and weight, but not much strength against crushing or impact. All mixes work good for display items, but for performance wearable masks, none meet my criteria as-is. I will add strips to the weakest of the casts to see if it's worth the effort. 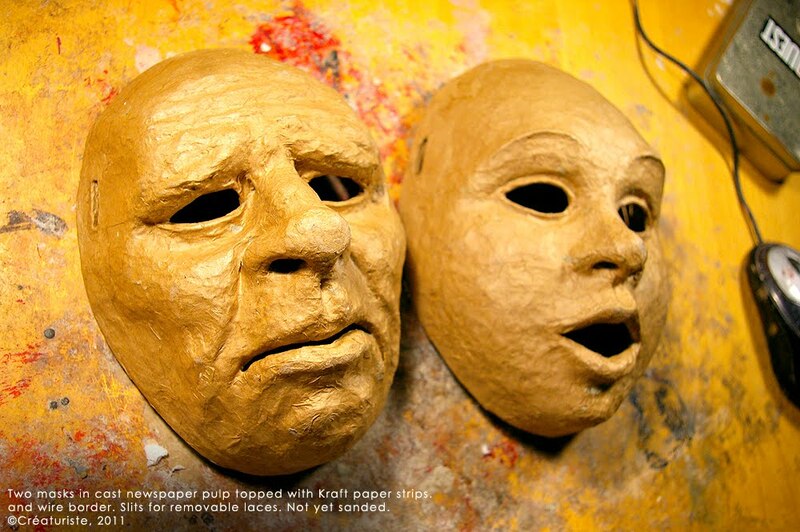 • I added two layers of Kraft paper strip to the newspaper pulp casts of the masks, and the added strength is surprising! With the wire outline, I have a feeling these masks will be up to my standards of durability. The kraft I used this time is thin, likely the same that lunch paper bags are made of in Canada and the USA. I crumpled and soaked and wrung out the water from the paper, to soften it before use. I have added pulp over strips before, and it works so long as the strip project is strong and stable. Yet I had never fully successfully cast pulp by itself before, as each cast required major "surgery" to look good. Now, with just newspaper pulp and boiled wheat paste, pressed down wioth a thick cellulose sponge to remopve all mositure that I could, I have succeeded. The strips stuck well to the dry pulp cast, but I made sure of that by rubbing a very thin coat of wheat paste all over the cast prior to adding the strips. Adding anything to a non-sealed paste-based project can temporarily make it soft again, so I was careful and placed the casts back into the molds, for safe keeping until dry enough again (in front of a fan for a few hours) to stand on their own without warping. Careful extra drying is done once release again from the mold. I will report back when the first mask is fully assembled, dry, sealed, and put throuh my vigourous testing. Three of the casts (the two newspaper pulps and the one egg carton) are now trimmed, edged with wire, and have an extra layer of Kraft paper over the front. I love the subtle texture even more now, and it's not even sanded down yet. Semi-dry, i can already tell these masks are very strong. Sealing them with shellac will only increase their durability. 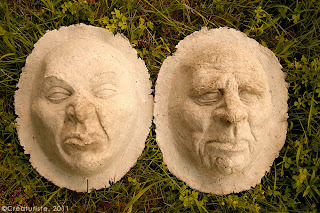 • I made two new casts, still using the newspaper pulp and boiled wheat paste, pressed down with the cellulose sponge. I decided to try applying the pulp as thin as I could without seeing the mold through it once sponged. It works even better, dries faster, and weighs less. Of course there are more tiny holes that you can see in front of a lightsource, but these will be fixed with the two layers of Kraft paper inside, and one on the surface of the mask. I feel like I am getting close to a favorite way of doing paper mache masks. Faster, better resolution, just as strong as my all-strip masks? It's all goooooood! Over the years, the frequency of puppets requiring mouth plates has increased in my production. I've been trying different types of mouthplate materials, and I really like one material above all else for a hinge material: nylon webbing (backpack straps). 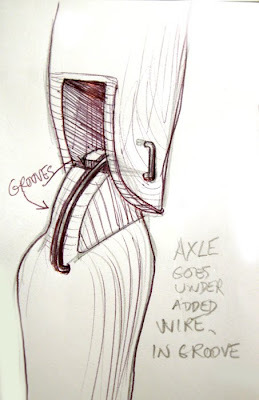 This article shows what I do with it, to make a mouth plate. The design is symmetrical, and can be worn on the left or right hand. Very comfortable, if glued well-aligned with the mouth. The center zigzag stitch separates the hand grips in half. This piece was a test, and was removed because I messed up the alignment in the puppet, and the side stitches flaring out were not easily flattened down. Look below fore a better version of stitching the sides. This one is not made of nylon webbing, but it is a similar looking product, I think it's a natural fiber. Pros: very strong, one piece, won't un-glue itself. 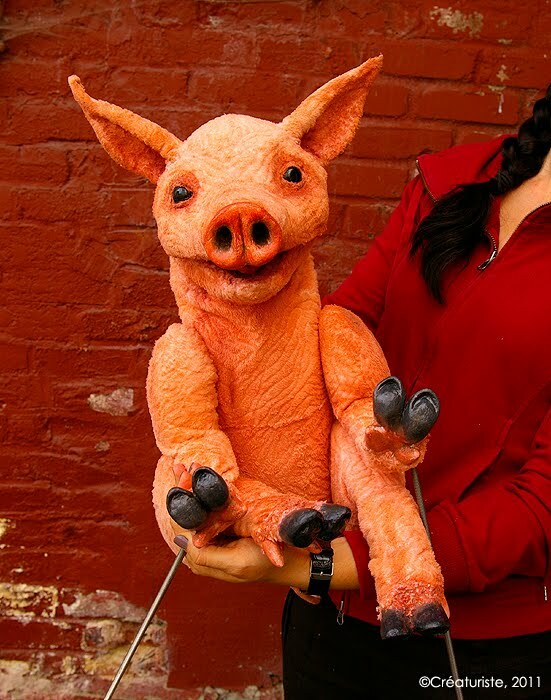 Cons: only works for lightweight puppets that don't require a finger grip (like a half ball). Be careful to give enough space for fatter fingers than your customer's, just in case. I started using this marvel stuff years ago, after having problems with a leather mouthplate stretching out of shape and ungluing itself because of extreme moisture in the air. Nylon webbing doesn't seem to stretch at all, won't rot, and doesn't seem to get brittle. It accepts hot glue wonderfully, but it drinks in contact cement a bit between its weaves, so we need to use several applications before proper surface contact is achieved. The contact cement stiffens the hinge area, so don't put any where it will bend. 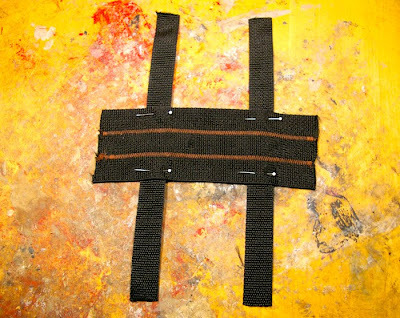 More often than not, I can't find the webbing in a wide enough variety, so I use two or more next to each other, to create the proper hinge width. I nowadays zig-zag stitch them flat next to each other, using the sewing machine. I picked up that trick from a customer who is very good at sewing, when she learned that I was going to have to use the narrower webbing for some puppets I was making for her. Been zigzagging it ever since! Once stitched, the hinge is measured within the head, marked, and trimmed. The perimeter is zigzag stitched twice to prevent unraveling. Might not be necessary, with the contact cement later, but I prefer to play it safe. The webbing can be somehow uncomfortable at the edges, so once installed in the mouth, covering with a soft but durable fabric will increase comfort and durability. Sometimes the design requires finger tubes, so I make these out of the same nylon webbing, but make sure to machine stitch it flat, then loop the lengths on both side up and hand-stitch them together once I have the required fit. Be careful not to stitch too thickly where the webbings link with each other, or you'll have an uncomfortable bump. The middle finger is free to operate one of my eyebrow triggers. What an actual nylon webbing hinge looks like before it is stitched together flat. The webbing I had was narrow, so I zigzagged three together (brown stitches in the center). The pins show where the zigzag stitch must be well done to ensure durability. Avoid over stitching into lumps though. 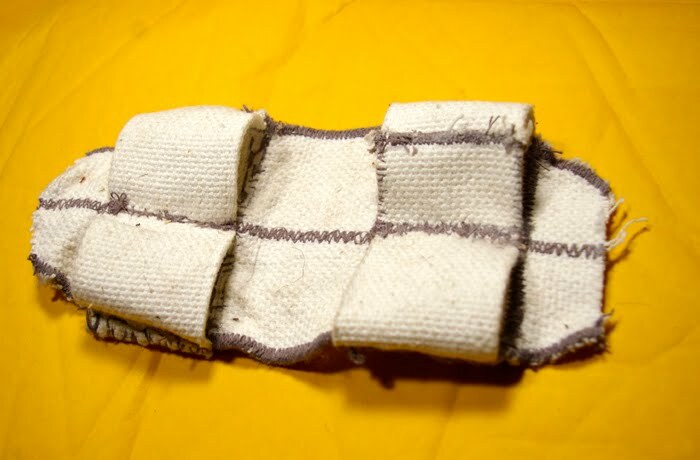 The "legs" are joined together, trimmed to size, once measured, then their edges zigzagged to prevent unraveling, then each tube is hand stitched together. 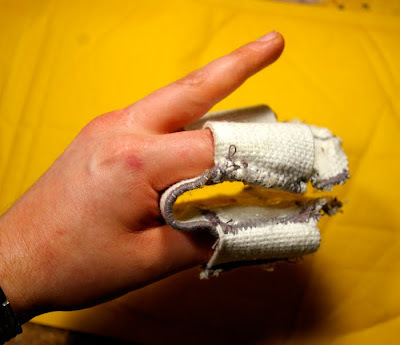 An extra stitch is done over that to split the hand grip in half, if necessary for the design (see first picture). •Nylon webbing can be made into puppet hair, by simply unraveling it. Usually, it unravels only in one direction. Some weaves of nylon webbing don't unravel in any usable way. •Using a waterproof fabric inside the foam puppet's mouth will enhance the durability. I made a puppet about two years ago that has a liner of umbrella fabric. It's lasting to this day. It might be sluippery with sweat, so be sure that you have a good grip as part of the design. I had a half ball of closed cell foam as a finger grip on the upper mouth plate. I made up this control really fast, to replace the fragile (and broken), overly complex control that came with a rod marionette my customer brought from Belgium. 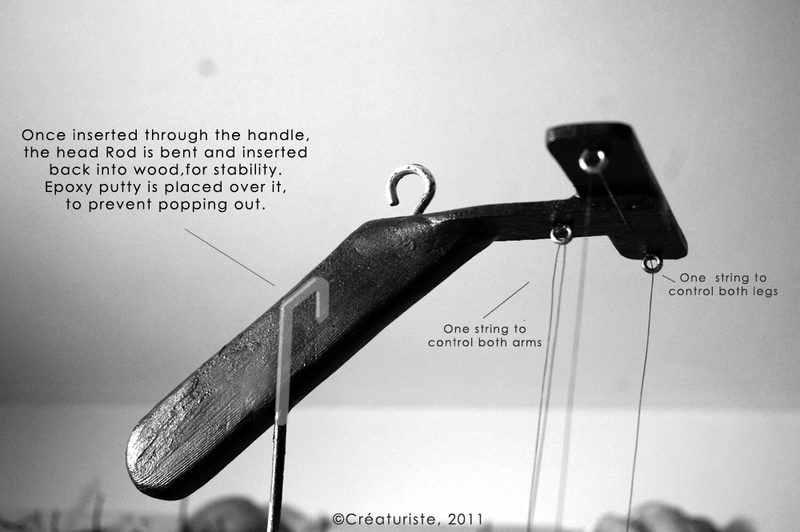 The marionette itself was well built. I had to simplify the system so that amateurs could make it move really well, at first. So I made it in one piece, no movable parts on the control. The handle is a piece of pine. The horizontal extension is made of two pieces of hardwood, which I cut from the bigger paint stirring sticks I found at the hardware store. I love those! The are pre-pierced to prevent splitting, glued in place, and screwed as well. The screw eyes are inserted with a bit of glue, until their base sinks a bit into the wood, to make sure the strings will never grab or escape. Their ends that poke through are cut flush with the surface. All the screw heads are covered with epoxy putty. The control parts are filed and sanded smooth while still separate. Another step of sanding and filing is done on the assembled control. 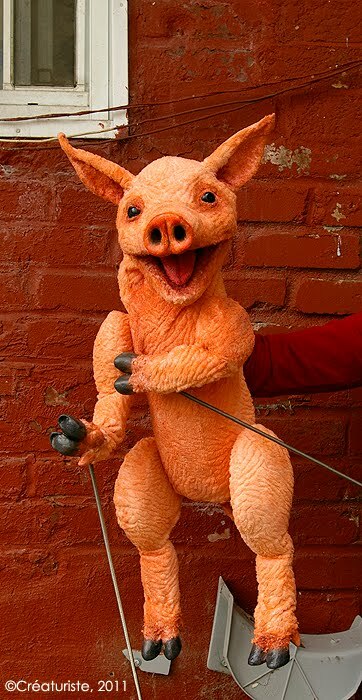 Only two strings operate the arms and legs. The leg string goes through both screw eyes at the top. The arm string goes through the single screw eye. Because I didn't have the time to replace the rod, I had to break the old control off of the rod, and build my new control over the existing, already-bent rod. this meant I had to carve a channel into my wooden handle to snugly hold the rod in place. I then filled it with epoxy putty (plumbing grade). I like the one from PC products (USA), because it is very strong, and cures well within 20 minutes. Once applied, you can smooth epoxy putty with a bit of rubbing alcohol on your gloved finger. When cured, a filing and sanding can be done to achieve a seamless result. I painted the whole control with a glue-based black paint of my own composition. Grab leg string, and the opposite side of the arm string, then activate the legs. This makes the rod marionette walk with the natural opposition of arms and legs (left arm raises as the right leg does same). Yesterday, I had the chance to make a new control for a rod marionette from Europe. I don't get to see those often, and every time I learn something new. 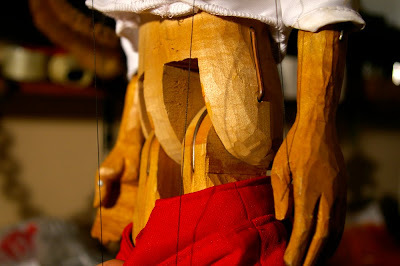 This time, on the Pinocchio puppet, I noticed the simple yet sturdy system the artist (unknown, probably from Belgium) used for the knees and hips. Instead of the usual hole in the wood, where the axle can and will enlarge said hole, they made a groove on top of the piece of wood, inserted a piece of thick wire to cover the groove, used an axle on the other piece of wood, which links up to the initial piece by going under the metal wire. Metal on metal is strong. It's a little bit squeaky though. It was barely noticeable on the Pinocchio. I often recommend these sources for inspiration. They all helped and are still helping me better my life. I dedicate this article to all artists, who may have been struggling with money and abundance. Let's fight the clichés and unproductive, self-destructive beliefs. The age of the Starving Artist is over! (I listen to the audio, but I also have the actual book, to carry with me). Every time I focus on it, even just a little, I get demonstrable results. Just last night, I found 7 "banker's boxes" I needed for better storage and order, for free. I had been thinking I needed them just the day before, and told myself I WOULD find them. Wasn't even looking for them. Works for small things, and bigger things, including events. Let's make this a habit, and grow abundance for all! I've been working on 5 contracts at a time these days. 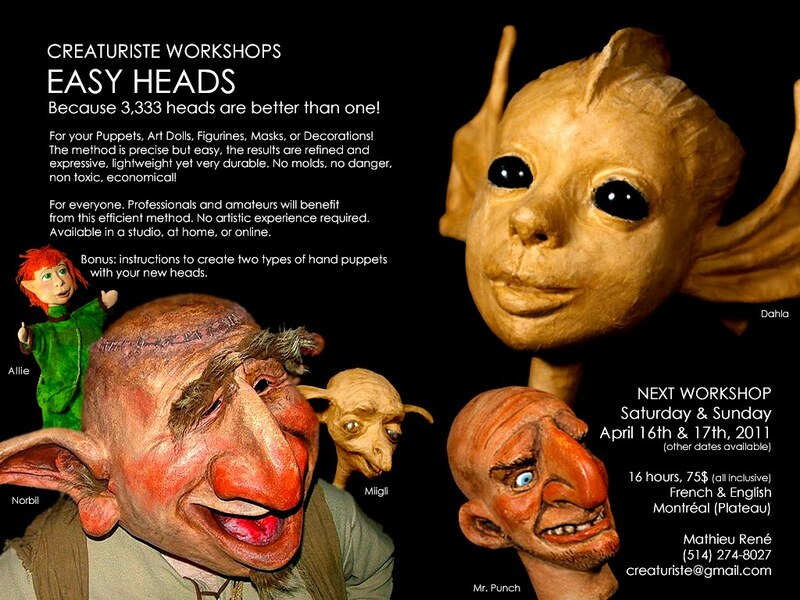 One of the most exciting is designing and fabricating 10 character masks for training actors in a Theater school. The advantage is that I will also be able to sell copies, since I am taking the time to make each mold durable and precise. So if you're into masks, stay tuned, or contact me to speed up thing is you want one for yourself or to offer as a gift.